Today, September 30, 2015 is the final day to enter the Web Marketing Association’s 4th annual international MobileWebAward. If you have not entered already, now is the time to do so. Impress your friends, show off to co-workers, get a raise from your boss – theses things are all possible when you win awards. This is the “award” in “Award-Winning Mobile App or Website”. The entry form and complete information can be found at the MobileWebAward Competition website. Enter your best mobile work today and get the recognition you deserve! 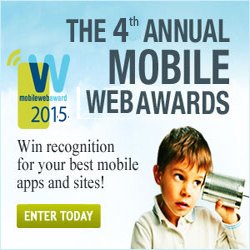 The Web Marketing Association Call For Entries for its 4th annual international MobileWebAward competition ends in one week (Wednesday, September 30, 2015). This award program recognizes the individual and team achievements of Web professionals all over the world who create and maintain the best mobile Websites and the best mobile applications. The entry form and complete information can be found at the competition website. Enter your best mobile work today and get the recognition you deserve! team, but it can be an important tool to your marketing program. 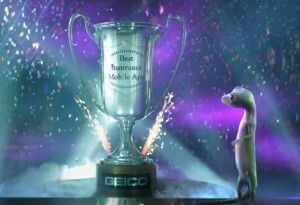 For example, Insurance giant GEICO won Best Insurance App in last years competition and used the fact in a GEICO TV spot, created by The Martin Agency, currently running. All in all, we like our MobileWebAward trophy much better. 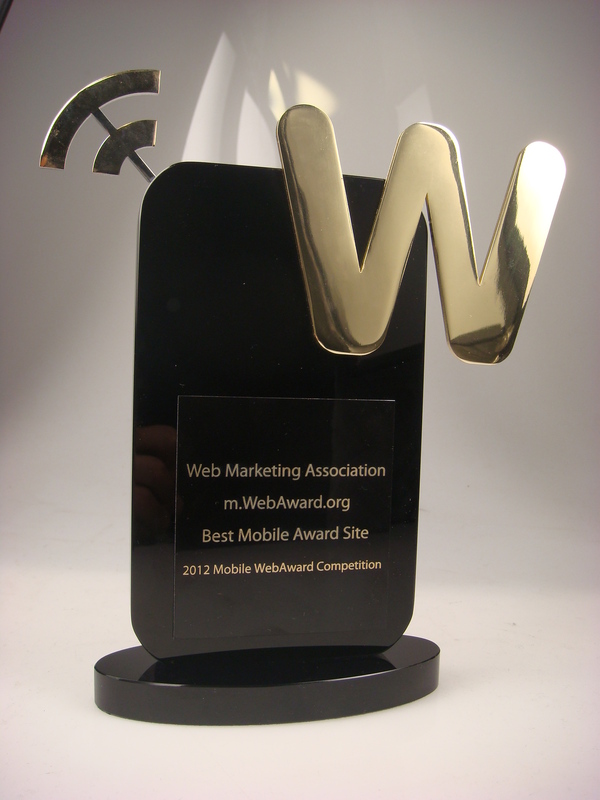 Two weeks remain to enter the Web Marketing Association’s 4th annual international MobileWebAward competition. The deadline for entry is Wednesday, September 30, 2015. This award program recognizes the individual and team achievements of Web professionals all over the world who create and maintain the best mobile Websites and the best mobile applications. The entry form and complete information can be found at the competition website. Enter your best mobile work today and get the recognition you deserve! The Web Marketing Association is pleased to announce the winners of its 19th annual WebAward Competition for Web site development. More than 1,500 entries from 40 countries were adjudicated in 96 industry categories during this year’s competition. Entries were judged on design, copy writing, innovation, content, interactivity, navigation, and use of technology. The 2015 Best of Show WebAward is presented to Trailer Park, Inc. for their excellent work on JurassicWorld.com. The site was also recognized as Best Movie Website. This is the second Best of Show win for Trailer Park. The also won the 2008 Best of Show WebAward for Harry Potter and the Order of the Phoenix website. Jurassic World is the latest sequel in the storied Jurassic Park series. JurassicWorld.com, brings the in-world theme park to glorious digital life. The site let fans explore the setting for the new film, while giving tantalizing glimpses of the park’s new dinosaurs – and what might go wrong to eventually lead to the biggest thrill ride of all – Jurassic World, the movie. 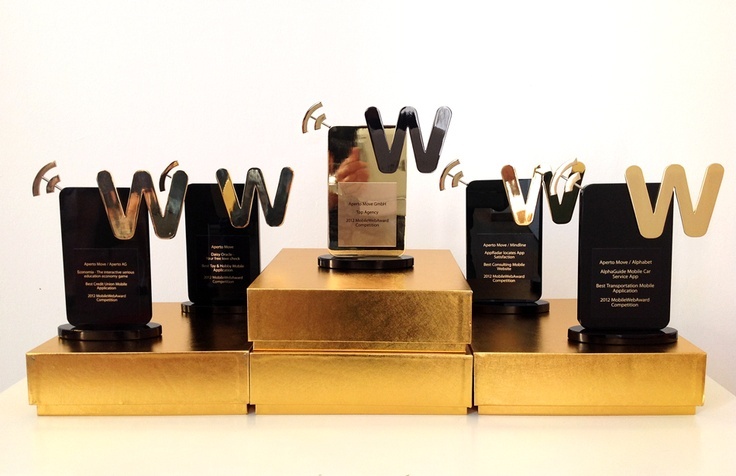 Extractable was named Top Agency at the 2015 WebAward Competition, taking home 31 WebAwards this year. This is the fourth time Extractable has won the Top Agency WebAward, following up top honors in 2014, 201 and 2009. The Top Agency Award is given to recognize the consistently outstanding development going on at interactive firms. An independently owned, full-service advertising agency based in San Francisco, Extractable blends user experience, creative and technology with insights from data to create innovative digital platforms that deliver results across all media and devices. The agency was recognized in the 2015 WebAwards with Best Advocacy Website, Best Computer: Hardware Website, Best Information Services Website, Best Family Website, Best Electronics Website, an Outstanding Website WebAwards and 25 Standard of Excellence WebAwards. The 2015 WebAwards are sponsored by the following leading organizations: Small Army Creative Services, PR.com, ad:tech conferences, ClickZ Live, EContent Magazine, VerticalResponse, Webmaster Radio and Website Magazine. There is only one month left before the Sept 30th entry deadline for the Web Marketing Association’s international MobileWebAward competition. If you want to boast about having “award winning” mobile apps and websites, this is the award you need to win! This award program recognizes the individual and team achievements of Web professionals all over the world who create and maintain the best responsive and mobile Websites and the best mobile applications. The entry form and complete information can be found at www.mobile-webaward.org. Enter your best mobile work today and get the recognition you deserve!